Jean Paul Gaultier's Paris Fashion Week show ran more like an arrival, than a lamenting departure. Today, the designer wrapped up his 38-year running in Paris Fashion Week, ending his ready-to-wear collection, which has been donned by some of the fashion industry's most on-top models from Grace Jones to Karlie Kloss. But instead of anticipated tears and sorrow, Gaultier went out with a bang, paying homage to the evolution of his collections and the people who wore them. The show ran like a pageant, with guests donning "Miss Jean Paul Gaultier" sashes reminiscent of the French flag. Models on the runway also donned sashes as they competed to be crowned a pageant winner. 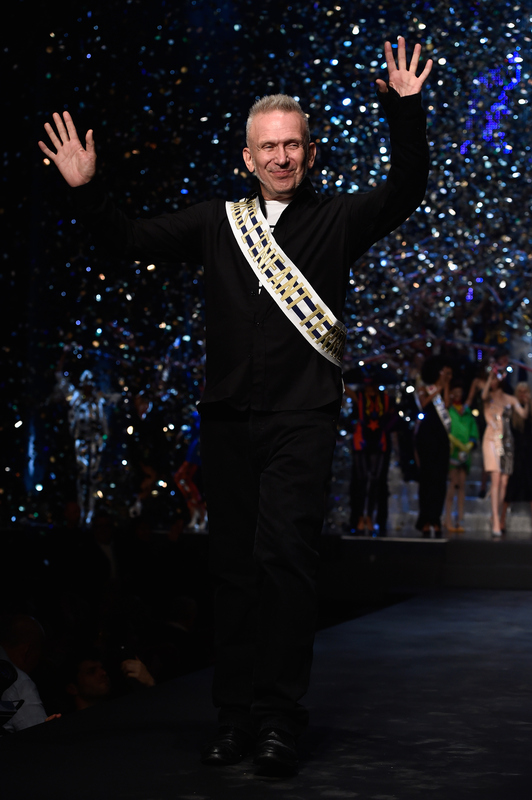 Aside from the sashes, however, was Gaultier's devastating final s/s 2015 collection, which guarantees that his departure will be one of the most memorable one's yet. Opening the show, models fashioned to resemble another decade danced in white boots and exaggerated bouffants to Prince's "1999." He dedicated a portion of his show to VOGUE's fashion authorities, Grace Coddington, Suzy Menkes, Franca Sozzani and Carine Roitfeld. Bringing us back to 2014, he sent Izabel Goulart down the runway with hoop earrings and a matching short-top set, to snap a selfie. Models battled it out while rocking superhero (or were they villains?) masks. But at the end, it was Coca Rocha who was crowned the fairest of them all, stepping over a playfully collapsed model in a classic sleeveless Gaultier dress. Although the designer is calling it quits with his ready-to-wear line, he is not off the market just yet. According to The New York Times, Gaultier plans to focus on his couture and fragrance collections in the upcoming seasons. Check out photos from the designer's final lap down the ready-to-wear runway.